Do you want to taste a Spanish version of callos? Then I think this Callos a la Madrileña is what you might want to cook and serve for a special occasion or just a weekend lunch. It consists of oxtail, ox tripe, and pig’s feet with chorizo de bilbao and veggies like garbanzos and bell peppers. Since oxtail is quite expensive, you can substitute it with ox skin and some beef briskets which is cheaper. When buying ox tripe, you will have to decide if you want to buy in the supermarket which is already cleaned. But the trade off is the ones bought in the wet market is tastier but hard to clean. 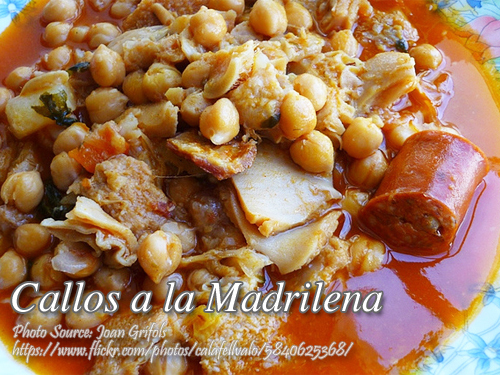 To cook callos a la madrileña; Pressure cook the tripe, oxtail and pig’s feet until tender. Slice tripe, oxtail and pig’s feet into an inch square. Save the broth and set aside. In a pan, heat olive oil and saute garlic until fragrant. Add onions and saute until brown. Add the ox tripe, ox tail and pig’s feet and stir cook for 5 to 10 minutes with sliced chorizo and the siling labuyo. Add in 2 cups of broth, tomato paste and sugar. Season with salt and pepper to taste. Add in the garbanzos and bell peppers. Cover and simmer for 10 to 15 minutes. Pour hot sauce and bread crumbs. Stir cook until thick. Serve hot. Just in case you bought the ox tripe in the wet market, you need to clean it very well. Wash the tripe thoroughly in running water. Clean it by scraping the stomach contents sticking on the tripe surface. Rub plenty of rock salt and wash again. Do this 3 times then boil 4 cups of water with 1 tablespoon baking soda. Put the tripe in boiling water and boil for 15 minutes. Throw the water and repeat the procedure again. Then pressure cook the tripe, oxtail and pig's feet until tender. Slice tripe, oxtail and pig's feet into an inch square. Save the broth and set aside. In a pan, heat olive oil and saute garlic until fragrant. Add onions and saute until brown. Add the ox tripe, ox tail and pig's feet and stir cook for 5 to 10 minutes with sliced chorizo and the siling labuyo. Add in 2 cups of broth, tomato paste and sugar. Season with salt and pepper to taste. Add in the garbanzos and bell peppers. Cover and simmer for 10 to 15 minutes. Pour hot sauce and bread crumbs. Stir cook until thick. Serve hot.